When China sneezes, the whole world catches cold. Today I’m meeting friends who can open their hearts to me, and mine to them. We naturally begin our non-agenda conversation with Burmese domestic politics (Section 66d, etc) which naturally drifts to the peace process, the involvement by big powers, and, as can be expected, to China. 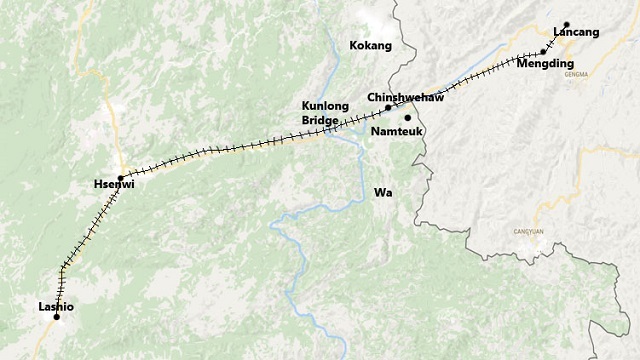 · The MoU for the Yunnan-Kyaukphyu railway project has expired. And China seems to have decided on a new proposal: Instead of Mangxi (Mong Khawn to Shans)- Ruili (Mong Mao to Shans)- Muse-Lashio, as the previous project called for, it is now proposing a new route: Mangxi- Lincang-Mengding (Mong Ting to Shans)- Chinshwehaw (in Kokang on the Burmese side) – Kunlong and Lashio. When the State Counselor visited China in August, a new agreement was signed to build a (new?) bridge in Kunlong on the Salween, which connects Chinshwehaw with Hsenwi and Lashio. 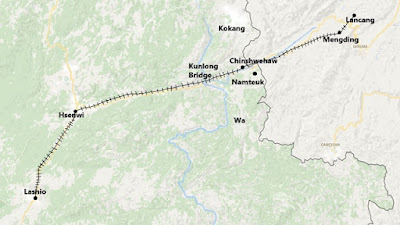 As the projected Chinshwehaw-Kunlong-Lashio railway passes along the Ting River, a tributary of the Salween, and forms as a natural boundary between Kokang and Wa, the implication is that the Wa will be torn between its security concern and the reluctance to offend China. “They will also realize that if Naypyitaw gives everything Beijing wants, which is not foreseeable at this time, their status as China’s proxy will become precarious,” comments one. · China is said to have 3 special departments under its foreign ministry: Myanmar Affairs, North Korean Affairs, and Afghan Affairs. It proves how high Beijing is prioritizing Burma. In the evening, representatives from Shan parties, armies and CSOs meet at Shan Yoya, a Shan restaurant at Wadan Road, near the Panda Hotel, to discuss how, where, and when the Committee for Shan State Unity (CSSU) should be held to plan for the National level Political Dialogue (ND). There’s an old saying that says,” Where there is a will, there is a way.” So do we have the will?